NEW ORLEANS — Parkview Baptist (12-0) will face Notre Dame of Crowley (11-1) for the State 3A High School Football Championship at 4 p.m. this Saturday at the Mercedes-Benz Superdome. It will be Parkview’s fifth trip to the State Finals since 2000 and the opportunity to win their fourth State Championship. Parkview is the only Baton Rouge area school to make it to the Superdome in any classification this year. Ranked No. 1 in the state, Parkview has punished its opposition, even defeating two 5A powers, Catholic High and Scotlandville. Coach Kenny Guillot has coached Parkview to all of its Championships. A veteran of 36 years’ coaching, Guillot is one of the most respected high school coaches in the state. The Eagles are lead by senior quarterback Brennan Bozeman, an impressive field commander who has racked up 1,099 yards and 16 touchdowns passing, along with 755 yards and nine touchdowns rushing. Another star for Parkview is running back Hezekiah Randolph, who has been nearly unstoppable this year. He ran for 1,236 yards and 21 touchdowns, and made six TDs receiving. Erik Martinez has 760 yards and nine touchdowns rushing, and Conner Hodgeson has 712 yards and eight TDs rushing. In addition to Randolph, the leading receiver is Tom Wing, who caught 22 passes for 361 yards and five touchdowns. Tom Wing is the brother of LSU punter Brad Wing. Defensive leaders include linebacker Hunter Brian, linebacker Ridge Womack, free safety Austin Suit, defensive back Mannie Mukes, and defensive lineman Victor Gutierrez. Guitierrez has 23 solo tackles this year, 60 assists, and nine quarterback sacks. 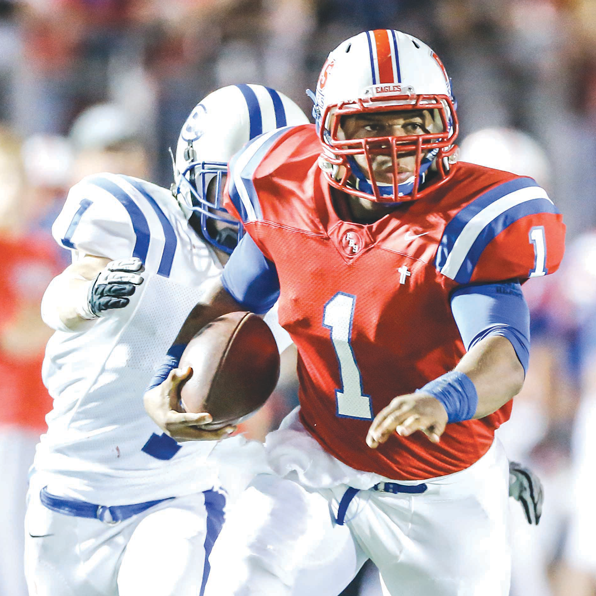 Parkview had little trouble defeating Livonia last Friday night in the state 3A semi-finals. The final score was 49-6. The wheels came off Livonia in the 3rd quarter. After that, Parkview scored at will. Coach Guillot said the Scotlandville and Catholic games were the most memorable of the season. The first game of the season against 5A Mandeville was cancelled because of bad weather. After that, Parkview opened the season against Scotlandville, which had been predicted to win District 4-5A. After easy matches against Redemptorist and East St. John, Parkview played Catholic, a 5A powerhouse and a team clearly out of Parkview’s league. But that didn’t matter to Guillot and his Eagles, who fought their way to a 39-34 victory. Catholic made it to the quarterfinals in the state 5A playoffs. Parkview won State Championships in 2001 against Belle Chasse, in 2007 against Westlake, and in 2010 against Patterson. It lost in the finals to Notre Dame in 2009. Notre Dame is consistently one of the top 3A teams in the state, having reached the semi-finals 11 of the past 13 years and the finals in seven of those years. This year’s Notre Dame team is led by a sophomore quarterback, Brad Stoma. The tailback, Luke Broussard, has rushed for 1,458 yards and 14 touchdowns. This will be the fourth time Parkview and Notre Dame have met in the playoffs over the past four years. Notre Dame coach Lewis Cook, Jr. joked that Parkview and Notre Dame know each other so well that they don’t really need to exchange game films. Cook is one of the winningest coaches in Louisiana football history. His victory over East Feliciana in the semi-finals last Friday gave him an overall record of 287 wins and 75 losses as a coach, moving him into sixth place among coaches in career wins. He mentioned the outstanding off-season work done by Coach Mayet, other coaches, and players. The Eagles have 87 players on their roster, including freshmen. One of the inspirations for the Parkview team this year was the late Samuel Brett Wimberly. Wimberly, who would have been a senior lineman, died suddenly in February after an illness led to a heart ailment. His No. 56 was retired earlier this year, the first time a Parkview player’s number has been retired. On Friday, the Eagles will travel to New Orleans in the morning to work out in the Dome and then return to Baton Rouge in time for a 2 p.m. pep rally. Guillot said this year’s Eagle team owes a lot to the Parkview administration, faculty, parents, and the community. He said they are especially grateful to the spirit groups such as the Silver Steppers, cheerleaders, and band. “You have to attend one of our prep rallies to understand the tremendous backing we have,” he said. Coach Guillot previously coached at Tara, Broadmoor, and Woodlawn in the Baton Rouge area. He was an assistant coach at McNeese State and Nicholls State. He was out of coaching nine years. Guillot said one of the pleasures of returning to the Dome is getting to see old coaching friends, such as B.L. Fairchild, the Istrouma football legend whom Guillot served under at Tara. Other favorites he looks for include Steve Mattox of Tara, and Mike Mook and Wayne Messina of Woodlawn.